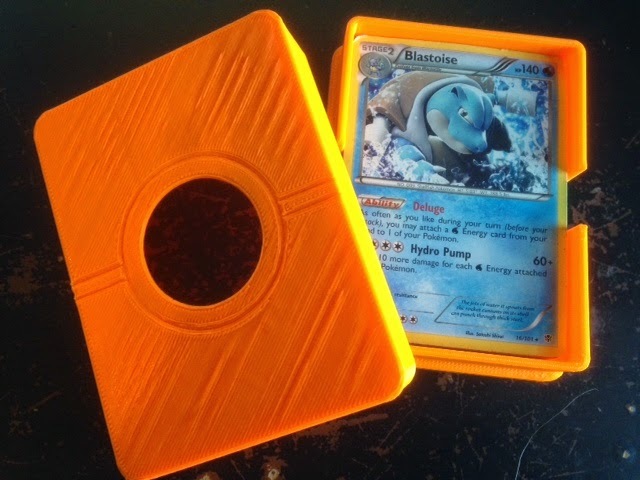 One last print for C's Pokemon addiction: jessed's Pokemon Deck Box on Thingiverse. Settings: MakerBot Replicator 2 with .3mm/low and a raft, on blue painter's tape on a glass build platform. Technical notes, printing flavor: For some reason large, flat things tend to print out all stringy on my Replicator 2. This isn't a new thing; we've had this problem since at least as far back as when we were printing Menger Coasters on Day 121 and Day 122. The situation improves if I switch to .2mm layer resolution, but does not go away entirely. The weird thing is the the rafts print perfectly, with flat, beautiful surfaces. If you know why this happens and what setting or technique will help, please let me know!